Artfully Awear: WHOSE COAT IS THAT JACKET YOU'RE WEARING? My interest was piqued as my favorite coat came to mind. There is something almost familial about a beloved coat--it keeps you warm during the coldest months of the year! 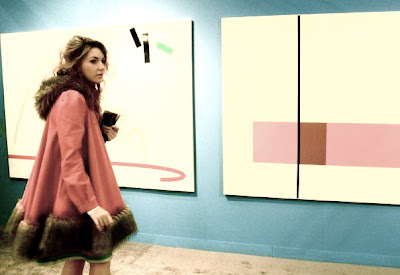 In the installation, Whose Coat is that Jacket You're Wearing?, artist Mike Ballard attempted to come to terms with the theft of his favorite coat. Over the past ten years, Ballard lifted men's outerwear from bars and pubs around London, cataloguing their contents, and storing them in his home, never to be worn or used. In his installation this fall, he will reveal the over 200 stolen coats, and return them to anyone who can identify where they were lost or their contents. The exhibition will be on view at Walker's Tailor in London from October 8-23, 2010. Click here to read the full press release. My pink fur-trimmed coat is by Julie Haus and it is the only way I survive the winter! Apparently artist Mike Ballard swiped this idea from "John the Jacket Man". Check out the original radio interview here. This just keeps getting better! When I was little I had a picture book about a fairy who helped people. Winter came, and she had a pink coat that looked just like yours. She gave it to a frog who was cold. I LOVE that coat! How beautiful! ur fav coat is my latest lust!! i want!!! I really really like your blog, I just started following! "Good artists copy, great artists steal." So where does plagiarism fit in? This is the exact same story with the exact same details that a hoaxer told on the Jeremy Vine Show (BBC radio 2) last year. OMG i was so in love with this coat.... Julie Haus fantastic designer and person. I know her personally along with her husband. Fantastic couple and very inspiring!! !